Sometimes you read a book, you moderately enjoy it, but when you finish it, you have very little to say about it. This is one of those times. 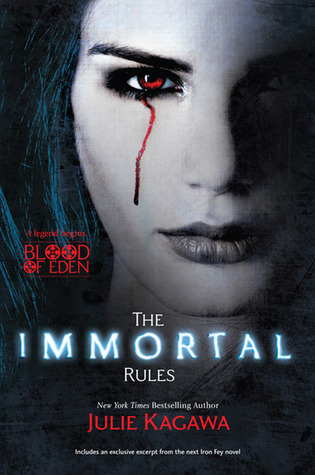 The Immortal Rules was a pretty entertaining read, but it simply failed to impress me. I suppose I expected more originality, but instead I got the same old story hidden behind a few interesting details. That’s not to say I didn’t have fun reading it – I did, for the most part, and I’ll definitely pick up the sequel. Allison Sekemoto grew up in the Fringe, outside the walls of a big vampire city. She has never set foot inside those walls – as an unclaimed and unprotected human, she is easy prey for any vampire she might run into. One day, while hunting for food, Allison’s crew gets attacked by rabids. After seeing her friends die and being savagely beaten herself, she is saved by a Master vampire Kanin and offered a choice: she can either die or be turned into the very thing she hates the most. I really enjoyed the worldbuilding at the beginning. I was hoping Allison would somehow explore these vampire cities, spend some time discovering New Covington and the life inside the walls. I wanted to know more about how they function, about the vampires and the humans that chose to live among them. I was vastly disappointed when Kagawa decided to lead her heroine out of there and have her wander around through wilderness where nothing was even remotely interesting. I realize that she’ll probably go back in the second book, but I wanted to know more now, and that feeling of disappointment when Alison ran out of the city and when I realized she won’t be going back soon stayed with me throughout the book. The second she left the city and started walking on her own, my interest in the book dropped by about 25%. It didn’t help that the middle part bored me almost to death: the time Allison spent alone and all that wandering around when she joined Zeke’s group didn’t work for me at all. In fact, I think this entire book would have been much better if it were a hundred pages shorter. Julie Kagawa is undoubtedly a talented writer and I could tell she put much thought into her worldbuilding (especially the first part), but it’s the little things that make a book and in my opinion, she failed in polishing those details, which ruined the story for me to some extent. It bothered me that certain things didn’t make sense, for example, when Allison joined Zeke’s group, they gave her an old tent to sleep in, but she still had to cut a hole in the bottom and bury herself in the ground every night to avoid being accidentally exposed to sunlight. I don’t know how dirty they all were, but it is impossible that no one would notice she was covered in dirt every evening. You sleep in the ground, you come out covered with it no matter what, and nothing short of a long bath and a complete change of clothes could possibly fix it. Another thing that didn’t work well for me was the romance. I didn’t really understand where the attraction between Allison and Zeke was coming from at all, and to be honest, I didn’t really like Zeke all that much. I like my love interests with just a little bit more fire than he had to offer – he was too vanilla for my taste. I would have loved to see a relationship between Allison and Kanin, the vampire who turned her, instead. It’s the first time I’m actually hoping for a love triangle in the future. Huh. I guess I had a lot to say after all. I realize that my opinion won’t be very popular in this case, but I had to share it anyway. The majority of my friends really enjoyed this book. After all the gushing reviews I’ve read in the last month, I’m pretty sure my lack of enthusiasm won’t do any damage at all. I enjoyed this immensely, although not immediately. When Kanin showed up it was in the middle of Easter for me and Kanin = Rabbit in Swedish. It put a completely wrong image in my head everytime I read his name, though I managed to ignore that after a while. The dirt thing - I actually thought about it and reasoned that with Allie not needing to feed as a human or make waste, her vampire body working differently (expelling bullets etc), the dirt would sort of fall away from her easier than a human body with living breathing skin. But we all have different levels for acceptance of paranormal things, I guess. Thanks for this review! I sometimes find myself feeling "meh" about popular books too. It makes me wonder if I missed something that others liked when I read a lot of glowing reviews. It was nice to read a mixed review for this book. Though I haven't read it yet, I'm curious to find out the author's writing style and her popularity. Hahaha, trust you to notice that detail about the dirt! That's hilarious. I bet they're all tramping through the woods just covered in grime. Doesn't it seem like every YA dystopian/paranormal these days involves huge chunks of time spent in the woods? Or is that just me? Sometimes it's hard to see why everyone else is so excited about a book, but I think your review is important. Not just you for sure. Oddly enough, this book reminded me a lot of Ashfall, with just a few vampires added to the mix. Wandering around aimlessly, running into all kinds of communities, it's all been seen before, I'm afraid. I just read this one! I thought it was the perfect mix between vampire romance and zombie apocalypse novel... It was some of the apocalyptic shortcomings, but I thought it did a fairly good job of overcoming those. There were things that made me bang my head against the wall (like the continued survival of a certain character) but I guess I understand. For the record, though: Kanin all the way! I'm team Kanin forever in this one, sorry. There's such a thing as "too good for my taste", I guess :) And that last scene before arriving there, when miraculously there's survival and no infection? I didn't buy that. PS. Did you have the e-galley? With the Iron Prince excerpt? Yes, I did, but I didn't read the excerpt. I already know that I'm going to read the book and it would probably just make me sad that I have to wait so long. Of course there's such a thing as too good for my taste! Plenty of fictional boys are like that for me. Usually, though, they tend to show just a bit more character, which makes it better. I appreciate your honesty as always, Maja. I know how you feel, a lot of people gushing over The Masque of the Red Death and it was just an ok read for me. I will be reading this book this week. I know that I can t least look forward to Kagawa's world building. I can't believe I just read you are wishing for a love triangle. I am glad though that you are always honest, I trust your reviews way more than those who consistenly give out high ratings. It's too bad that this book didn't blow you away like it did for me! But your honesty is always justified whether you love it or not, and I LOVE that about your reviews :) I actually never thought of that hiding-in-the-dirt thing before -- it's so true! "Sometimes you read a book, you moderately enjoy it, but when you finish it, you have very little to say about it." YES! This happens to me so often it's ridiculous. Glad to hear someone else shares my pain from time to time! Lol. I've heard from a few trusted bloggers that this didn't completely hold up to their expectations, but I'm still planning on giving it a go. It'll be interesting comparing notes when I'm finished though! I didn't like The Iron King, so I'm thinking this is probably not the book to re-try Julie Kagawa with. I love your attention to detail, Maja. :) That's something that would've probably annoyed me too. Eeep! I was hoping for a bit of a love interest in Kanin, too! As for the dirt: Now, I may need to go back and re-read, but I understood it to say that she cut that slit in the tent "in case" the tent and quilt didn't protect her from the sun. Fortunately, they did. She never actually buried herself in the ground each night because the tent sufficed. The biggest gripe I had (and you've read my review, so you know it wasn't much of a gripe) was the familiarity of parts of the story. I could name two books right now (I won't, as to not spoil anything for those who haven't read it) that were quite similar in style. I still thoroughly enjoyed TIR, but I confess, I'm glad I read it first, because now that I'm reading The Iron Fey series... well, let's just say I blame Puck for me loving it a wee bit more. ;D Great review, Maja! I very much enjoyed your opinion! "but instead I got the same old story hidden behind a few interesting details." Yup, that about sums it up for me too, Maja. And you know what, I would have rather seen a relationship develop between Kanin and Allie too, but the only thing that left me apprehensive about that was his age compared to her. She just seemed too immature to me throughout the entirety of the novel. And compared against his old worldness, I think if they did have a relationship other than mentor/student, I would have been a bit bothered by it, but I definitely think the possibility is there if she grows up. Actually your opinions are more supported than you think. This book has gotten a very mixed bag of reviews. I'm very wary of reading it- which means I'll probably read it in a couple of years. I think your review was brilliant and honest. Thank you for not swaying to what might be a more popular opinion. I'm proud of you Maja. OH! And btw you commented on my IMM on Monday and I wanted you to know that I reviewed Dark Wife by Sarah Diemer and I thought you might like to see the review if you already hadn't. Once again awesome review and I applaud your honesty.